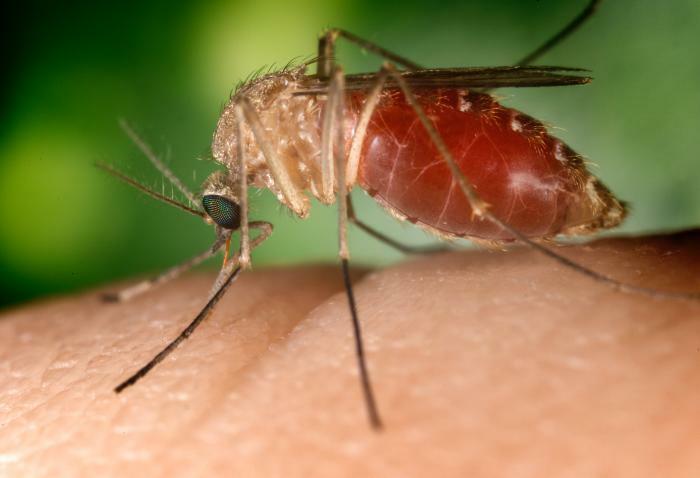 Potentially fatal mosquito-borne West Nile fever (WNF) can become much more widespread in Europe than previously thought, say scientists in a new report just out in the journal BMC Evolutionary Biology(1). The disease in temperate climates is carried by a population of Culex pipiens mosquitoes that only bites birds - the disease reservoir host - but Bruno Gomes and colleagues from the Centre for Malaria and Tropical diseases and Institute of Hygiene and Tropical Medicine in Portugal found high numbers of hybrids between this population and another one that bites on humans. These hybrids, by feeding on both humans and birds, can act as a bridge transmitting the disease to humans. The study was done in Portugal and follows recent reports of infected mosquitoes and several disease cases in this country. The brain infection WNF is originally from Africa and Asia where is usually rare and mild. While birds are the virus’ reservoir host - only in them can the virus develop and grow - the infection can be transmitted, through the bite of contaminated mosquitoes, to humans. In humans, the disease usually causes mild febrile symptoms, although, in some cases, can lead to severe neurological problems such as meningitis and encephalitis (acute inflammation of the brain) or even kill. In the last decade the virus has emerged in Europe and the United States (US) carried by Culex pipiens, the most abundant species of mosquito in temperate climates, particularly of urban (overpopulated) areas. Despite the fact that the virus seemed to be carried by a specific population of the species - the pipiens or Culex pipiens pipiens population - which feeds on birds but not on humans, several human outbreaks have been recorded, particularly in the US, where epidemics have spread everywhere in the country. Finally, just a few years ago, the US cases were linked to a new hybrid population - a breed of Culex pipiens pipiens (that bites birds and carries the virus) and Culex pipiens molestus (that bites humans) – able to feed on both species and, as result, acting as disease vector, transmitting the infection to humans. In Europe, however, no evidence of these hybrids was found and studies of the European pipiens and molestus populations suggested they were genetically too different to breed easily. Even more, on the north of Europe, the two populations were shown to occupy distinct habitats - with molestus living underground (in the London tube for example) and pipiens aboveground – further limiting their potential danger to humans. All this, associated with the fact that no outbreaks have ever occurred in this part of the world has reassured the European health authorities. Recently, however, reports in the south of Europe - where the two populations live together aboveground - of infected mosquitoes and sporadic cases of the WNF have raised the alarm and led to the study now published by Bruno Gomes, João Pinto and colleagues, which attempts to understand the real risk of WNF in this part of the world. In the study several Culex pipiens mosquitoes were collected in Portugal, close to an area of birds natural reserves, analysed and then allowed to breed so their first set of descendants could be studied. The idea was to determine the genetic closeness between the south European molestus and pipiens populations, as well as their potential to create the epidemiologically relevant hybrids. The collected animals were separated into the pipiens and the molestus populations according to their behaviour (a major problem in the studies of Culex pipiens is the fact that its different subgroups look very much the same), confirming that both populations were present, and then these were further analysed using DNA microsatellites. Microsatellites are repetitive segments of DNA that mutate so frequently that can be used to distinguish between populations that have not been separated long enough to have evolved more obvious differences, such as is the case with the Culex pipiens populations. Like in the north of Europe, the Portuguese populations were found to be genetically very different. Surprisingly, though, after being allowed to breed they showed a substantial numbers of hybrids - as much as 15% of their offspring - a number very similar to what was found in the US outbreaks. A more detailed molecular analysis showed also that hybridization seemed to take place in only one direction - from individuals that usually bite humans (molestus) to those that normally bite birds (pipiens). In fact, the molestus population was, by large, genetically, pure molestus, while many of the pipiens had a mix of genes from both populations. This result is important because, in the US, pipiens females seen feeding on humans were found to have molestus genes, suggesting that their introduction resulted in a more aggressive behaviour by the pipiens, as well as a “taste” for human blood, both crucial characteristics to initiate a human epidemic. A 15% of hybridization rate and signs of the pipiens acquiring molestus characteristics - does these mean a real danger of American-style WNF outbreaks occurring on the south of Europe? "Asymmetric introgression between sympatric molestus and pipiens forms of Culex pipiens (Diptera: Culicidae) in the Comporta region, Portugal"